John was born on the 27th November 1883, in Manchester, the son of the late Herbert and Mona Alice (née Samuell) Young (m. September quarter 1878). In 1891 (Census RG 12/3035) he was living with his widowed mother Mona Alice ("Living on own means") and older brother, Charles Herbert, at 24 Alexander Road, North Meols, Southport. In 1901 (RG 13/3323) Mona and Charles had moved to Stamford Road, Bowden, Altrincham, Cheshire. John attended Bedford Grammar School from 1895 to 1901 where he was a member of the Cadet Force for three years - see below - where he was at the time of the 1901 Census (RG13/1488). When he left School he studied with a Solicitor and in 1907 was articled Manchester law firm. In 1911 (Census RG 14/21236) he was employed as a "Solicitor" and living at the Lee Wood Hotel, Buxton, although it seems that some time in the next three years he moved back to the Stockport/Manchester area. Maybe he lodged at the Hotel, maybe working with his brother for a short time after qualifying. 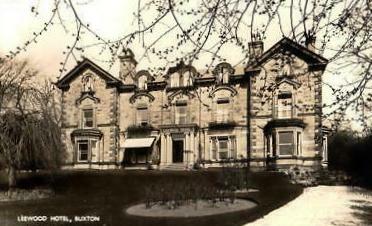 naming his brother, Charles, living at 'The Manse', Buxton, who was also a Solicitor. It would seem that before enlisting in the 17th Battalion, Sherwood Foresters Regiment, John had a short period of service with the Royal Fusiliers. Army Pensions Records indicate that he enlisted into the Fusiliers in Manchester on 4th September 1914, aged 30 years and 9 months. He stated that he had previously served for three years (1901 - 03) with the Bedford Grammar School Cadet Force and that his occupation was "Solicitor". He was recommended for Service in "The Public Schools and University Corps". However, he was discharged 47 days later, on 20th October 1914, on medical grounds, having been diagnosed with "Varicose Veins". His next of kin is named as his brother, Charles, living at 'The Manse', Buxton. At the time of his enlistment he was 5' 5½" (1.66 m.) tall, weighed 129 lbs. (58.5 kgs. ), had a 'fresh' complexion, grey eyes and dark hair. No doubt undaunted by his first rejection it seems likely John tried his luck elsewhere, later in the War. On the 8th February 1915 he attested in the Inns of Court O.T.C., at Stone Buildings, Lincoln Inn, London. After 59 days, he left the Territorial Force Battalion, on the 7th April 1915 with a view to taking up a commission in the 11th Battalion, York and Lancaster Regiment. On the 10th April 1915 John was Gazetted Temporary 2nd Lieutenant (London Gazette, 13th April 1915). His Commission in the York and Lancs, however, was short-lived, as on the 29th June 1915 John was Gazetted 2nd Lieutenant in the 16th (Chatsworth Rifles) Battalion, The Sherwood Foresters. He was transferred to the 19th Battalion on 12th September 1915 and again to the 17th (Service) Battalion (Welbeck Rangers) of the Notts and Derby Regiment in May 1917. John's varicose veins disability had reoccurred in 1916 when he was forced to leave his Unit on the 16th August. He sailed from Le Havre on the 19th, arriving at Southampton the next day. John spent 6 weeks in the Western General Hospital, Manchester, where a vein was removed from his left leg, in addition to those removed from both legs in 1914. The Battalion played a prominent part in the Somme Battle from August to the bitter end in November 1916. Their losses were heavy: These Battalions were also engaged in the 1917 offensive. Captain John Young was killed in action on 4th October 1917, during the Third Battle of Ypres, whilst based at Locrehof Farm. 1st. Routine. Companies under Company Commanders. 2nd. Routine. Companies under Company Commanders. Firing on Range. 4th. Routine. Companies under Company Commanders. Lewis Gun firing on Range. 5th. Routine. Companies under Company Commanders. 6th. Routine. Companies under Company Commanders. Firing on Range. 7th. Routine. Church Service in Cinema Locre." This suggests that they were behind the lines at the time and this is reflected in the fact that John was the only man from the 17th Battalion to be killed on the 4th, and just two others during that week. 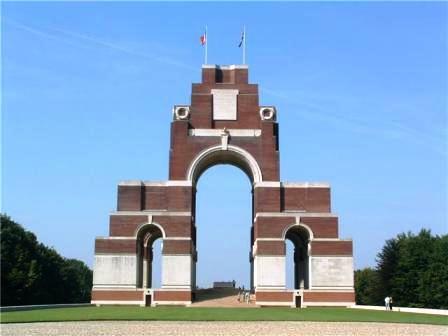 He now has no known grave and is commemorated on the Thiepval Memorial. "Near Kemmel on 4th October 1917, Capt. 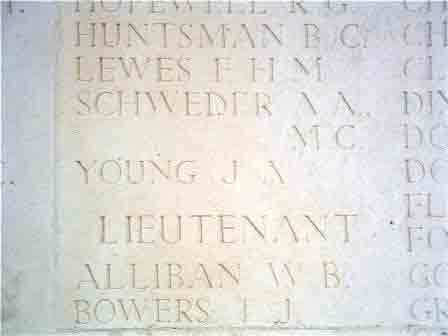 J A Young was in charge of 4 Lewis Gun Teams. When resting at Modern Dump at about 5 o'clock in the afternoon, Capt. Young, I and several others were hit by the same shell. I with others went to where Capt. Young was lying and saw that he was dead. About two hours later when I was leaving for the Dressing Station, I saw a group of Stretcher Bearers at the place where Capt. Young had been lying." "On October 3rd 1917 I was with Capt. J.A. Young (being his servant) at the modern Dump in front of Hill 60 near Ypres. Capt. Young was proceeding in charge of a number of Lewis Gunners who were being taken for duty to act against hostile aircraft, when a shell fell and exploded amongst us wounding myself and killing several others [not supported by CWGC Records]. I was no more than four yards [3.66 m.] away from my Captain at the time the shell exploded and on enquiring for him no trace could be found. I have no hesitation in saying he was killed as we were a very considerable distance behind the front line and it was impossible for him to be taken prisoner." "On the October 3rd 1917 on the right of Hill 60, near St Elvi, I was in 'D' Coy of the 17th Sherwood Foresters with a Lewis Gun Section on aeroplane protection duty ear support line. Acting Captain J. A. Young was in command of the party. Sixteen of us had just come out of a dug out when a shell burst on the ground amongst, killing eleven and wounding five of us. Capt. Young was killed, being blown to pieces." "On October 3rd 1917 our Battalion was close to Hill 60. Seventeen Lewis gunners were chosen out (Captain Young, myself and 4 others being from our Battalion) to go to an R.F.A. battery about 5 miles [8 kms.] away to fire at aeroplanes. We left the camp at about 12.30 p.m. on Oct. 3, but Capt. Young was unable to locate the battery we were making for. About 3 o'clock Captain Young left the rest of us in a concrete dug-out and went to see if he could find the battery. He was away about an hour and returned saying he had found it. We all came out of the dug-out, and were preparing to move on, when the enemy dropped a shell (probably an 8 inch) right amongst us, killing about 11 of our number, and wounding five. When we looked around we could see nothing of Captain Young, and therefore believed him to be blown to pieces." This latter statement being the case it is perhaps not surprising that John has no known grave and is commemorated on the Thiepval Memorial to the Missing. · I am grateful to Dave Naden for the photo of Captain Young's name on the Memorial and to Bronno for the copy of the War Diary. · I am also grateful to Colin Taylor for the copy of John's Service Record.